Get your hands dirty with farming work under the help of Vietnamese farmers. Unique experience for the kids, city people and western farmers as well. Halong bay is the top destination for all Vietnam tours Hanoi to Saigon. Only 2 day Hanoi Halong bay tour package makes you more and more surprised at hunderds of naturally sculptured limestone islands coming up majestically from green sea water. Halong tours have set up the new version of Vietnam luxury travel. What to do with one day from Hanoi for forever impression - Here is the solution with about 2 hour and 30 minutes drive south of Hanoi, you will arrive in Ninh Binh province home to Tamcoc, Trang An, also called Halong bay on land, one of the most beautiful destinations for Vietnam tours package. These places are top highlights of all package tours Hanoi to Ninh Binh. A peaceful and charming valley surrounded green rice fields, rivers, majestical limestone mountains and the beautiful stilt houses of the white Thai group offers different kinds of tours from adventure to culture discovery. This is one of good choices for your Vietnam holiday package. 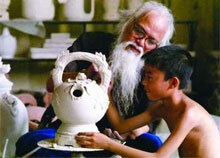 Vietnamese handicraft products are so beautiful and artistic. They are important hand-made gifts for most tourists on Vietnam Hanoi holiday. 1 day tour to traditional villages to see how they are made is great experience. Ha Noi are 2 separated words as Vietnamese people say. Ha means river. Noi means inner or inside. The land, surrounded by the Red River and Day river, is called Hanoi. Hanoi, Over 1000 year old capital of Vietnam, has experienced many ups and downs under the wars again Chinese, French, Japanese, American. Thanks to these, Hanoi has a blend of old Aisan city and stunning French colony style of the tree-lined boulevards and the aromas of fresh coffee. Even in the dynamic development, Hanoi still keeps its tradition and charm with beautiful parks, lakes, narrow streets filled with hawkers and handicraft shops, old charming temples - pagodas and many beautiful French colony architecture villas. All visitors to Hanoi have the same feeling: This is an unusuall city of Asia. In Summer 2012, Hanoi was rated as the cheapest destination for travellers by the US website Tripadvisor. Hanoi stood out of all the cities from 48 surveyed countries which has the largest number of tourists. This ranking is based on the total cost for 2 people on 2days/1night holiday staying at 4star hotel, 2 course dinner with a bottle of wine, a cocktail at 5star hotel and 2 km long taxi fare. The cost excludes VAT and service charge. The survey was conducted in Asia, Europe, America. London is the most expensive city for travellers. Peoples: King(viet),Hoa, Tay, Muong, Dzao..
Airport pick up service on Hanoi holidays, you should know that Noibai airport intends to allow your airplane to land on the terminals - A, B or E. The information is given to public on the electronic screen board which all tour guides will see and come to that terminal. However, for some reasons, the local authority may change your terminal and they do not inform on the electronic screen board or inform the public by speaker. All tour guides do not know and still wait there and think that maybe you have to apply the visa on arrival and it takes longer time. In the mean time, you come to a different terminal and can not find your tour guide. You may think that your guide come late or do no come. Do not take the invitation from someone for the transfer to Hanoi city centre because they may be illegal taxis. Our advice is that one of you go other terminals to look for your tour guide or just wait there your tour guide will find you in the end. Ho Chi Minh house and his garden from 8am to 11am and 14:00 to 16:00 except Monday afternoon and Friday afternoon. With a unique combination of something from French, Chinese... and Vietnamese, Hanoi food is probably the best of Aisa. In the survey by Business Insider Page, Pho Hanoi is on the top of the best 40 courses in the world. Pho Bo(breef Noolde soup) is selected as 28/50 most delicious course in the world in 2011. Hanoi is not a big stop of mordern and hi-tech products for shoppers, but it is a famous place of hand-made products and Souvenirs. The famous gifts which traveler to Hanoi bring home are Silk, lacquerware, embroidered goods(the most famous is embroidered pictures), silver, ethnic crafts and Vietnamese paintings of oil, silk, lacquerware.. See Hanoi shopping tips here to buy the best gifts. Like other parts of North Vietnam, Hanoi has 4 seasons: Summer starts in April to July. Temperature expects from 27oC to 39 oC. It is also a rainy season, but the rain normally lasts from 15 minutes to 45 minutes. Its high humidity sometimes annoys visitors, but it offers blue sky with beautiful sunrise. Autumn is the best season for those whose do not like the heat. It starts from August to October. Temperature is about 22 oC to 27 oC. Its sky is still blue most of the time. Winter temperature is from 10oC to 17oc. It starts from Nov to Feb. Spring is from Feb to the end of March with temperature from 15oc to 21oC. By air: Hanoi city centre is 35 Km from Noibai international airport. There are so many flights from France, Garmany, England, Japan, South Korea, Singapore, Thailand, Malaysia, Hongkong, China, Cambodia, Laos..... It takes 50 Minute drive from the airport to Hanoi city centre. By train: Trains from China, Saigon, Nhatrang, Danang, Hue to Hanoi. The train station is just 5minute drive to Hanoi city centre. However, the trains from these places to Hanoi is slow and domestic. It could be not good as you want. There are some reports from travellers getting in traps at Noibai airport. Some illegal taxi drivers wearing the uniforms of Noibai taxi company. They come inside the airport and invite you to take their taxi into Hanoi. They tripple charged or more by local Vietnamese money and you do not know the local currency. If you know the exchange rate, they try to take your money and dop you off somewhere nearby your hotel. Some of travellers tried to report the local policemen, but could not get back their money. It would be the best if you book your hotel with pick-up service or book your Hanoi vacation with airport pick-up service. If you want to go by taxi, just get out the airport. You will see someone holding a Walkie-talkie. She(he) is the taxi conductor. Book with her and do not forget to check the cost in advance. By Taxi: Taxis in Hanoi are operating by meters. However, you had better have your hotel or restaurant called for you. The reason is there are some illegal taxis and the drivers will drive round and charge you more money. Boarding is around 11.000 VND for 1.5km and the next km is about 8.500 VND. Please look at the meter when boarding and pay attention whether it is a highspeed ornot. If you go in couple, go by meter taxi. it will be always cheaper than taking 2 motobikes. However, if love adventure and tour Hanoi by motobike, you will get real and fascinating experience. There are many post offices around Hanoi offering basic services. The biggest international post office is located at the corner of Dinh Ten Hoang street and Ding Le street. Snake eating in Hanoi: So far as we have known there are many talks and controversy on whether people should eat snake ornot. 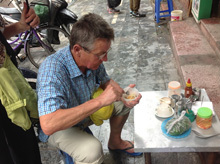 However, we have many clients on Hanoi holiday who ask us where to eat snake and is it good to eat snake ornot. We collect our clients' reviews as 85% says it is a liffetime experience to eat snake. It is a must-do on their holiday Hanoi. 15% says that they felt guilty. Anyway, we leave it for you to decise and we give some guide to do it. You take a taxi to Le Mat village, 7km from Hanoi city centre, which is a biggest raising and trading snake centre in Vietnam. There are many restaurants from you to try. The King cobra costs around 50USD. They will kill it in front of you. 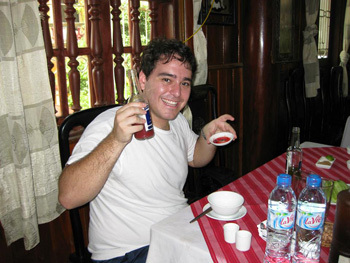 Drop the blood in a glass of rice wine. Take a still beaten heart on a plate. All will be brought to your table for you to try. The snake will be made into 10 courses. For 2person, it will costs around 75USD including taxi 2ways from Hanoi Old Quarter.